Chocolate Mudslide Frozen Pie is the pefect make-ahead dessert! 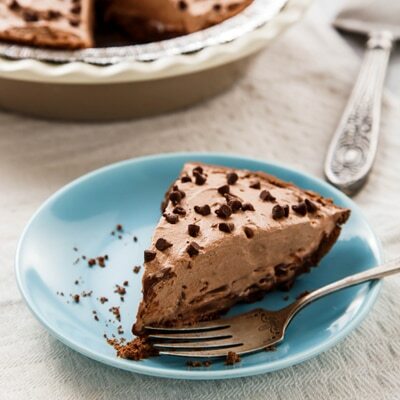 Chocolate crumb crust is topped with a mixture of sour cream, melted semi-sweet chocolate morsels and coffee, then sprinkled with a layer of mini chocolate morsels. MELT 1 cup morsels in small, heavy-duty saucepan over lowest possible heat. When morsels begin to melt, remove from heat; stir. Return to heat for a few seconds at a time, stirring until smooth. Remove from heat; cool for 10 minutes. COMBINE coffee granules and water in medium bowl. Add sour cream, granulated sugar and vanilla extract; stir until sugar is dissolved. Stir in melted chocolate until smooth. Spread into crust; refrigerate. BEAT cream, powdered sugar and cocoa in small mixer bowl until stiff peaks form. Spread or pipe over chocolate layer. Sprinkle with mini morsels. Freeze for at least 6 hours or until firm.